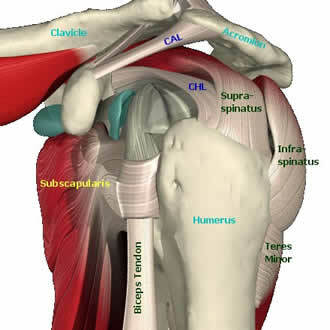 Shoulder joint has wider and more varied range of motion than any other joint in the human body. It’s also most unstable joint which means high risk of injury. Everyone has heard something about rotator cuff and related problems, but how many knows that rotator cuff muscles have very important role in a proper the shoulder function and injury prevention? The rotator cuff muscles (supraspinatus, infraspinatus, teres minor, subscapularis) attach around to the shoulder ball and help rotate shoulder as well lift the arm overhead. Rotator cuff muscles also stabilize the shoulder’s head in the shoulder socket and keep it in the proper position for a proper use of the arm. Rotator cuff muscle fatigue from excessive use, weakness or lack of endurance as the ball of the shoulder joint becomes more mobile and less stable (called instability). This causes the rotator cuff tendons to touch with the bone, which can lead to irritation of the tendon, inflammation and pain (impingement syndrome). Common causes of rotator cuff injury are repetitive overhead arm movements (volleyball, tennis, baseball and swimming), improper weight training, poor posture and aging process of the joints. In rehabilitation in sub-acute stage of Rotator Cuff you will start to strengthen your rotator cuff muscles which typically means shoulder internal and external rotation exercises with band. It’s also very important to make sure that shoulder joint have full range of motion and flexibility. Comprehensive shoulder rehabilitation program also includes shoulder blade stabilization exercises. If the shoulder blade is not stable, undue pressure may be placed on the rotator cuff. So, strengthening the muscles that support the scapula (rhomboids, trapezius, and serratus anterior) are important too. Even when you are pain-free and your shoulder has full range of motion, it’s important to still keep your rehabilitation going and build you strength and flexibility by preventing further injuries. Pilates is a method which works very well for rotator cuff post-rehabilitation and injury prevention. Pilates exercises focus on strengthening stabilizer muscles for your core but also other stabilizer muscles around your joints. This very unique exercise method helps you re-educate your injured shoulder to work together with rest of the body and avoid unwanted movement patters, muscle work and extra tension. Very often poor posture – forwarded head, rounded shoulder, abducted shoulder blades – can cause shoulder problems and shoulder girdle dysfunction. Pilates improves posture by balancing muscle imbalances. Training with a qualified Pilates instructor, who has good knowledge about proper posture, shoulder biomechanics and injuries, helps you use your whole body more safely, efficiently and economically. If you are lucky enough to find a truly experienced Pilates instructor, you will get big benefits from your Pilates training. Pilates does not only rehabilitate your shoulder and muscles, it also gives you invaluable information how you hold, use and work your body from head to toe by preventing injuries – and that information is priceless!